From left to right: Jim Park, chair of the TWNA Technical Award committee, Aperia CEO, Josh Carter and Brandon Richardson, Aperia’s Chief Technology Officer. NASHVILLE, Tenn. — Aperia Technologies’ Halo Tire Inflator won the 2014 Technical Achievement Award from the Truck Writers of North America (TWNA). 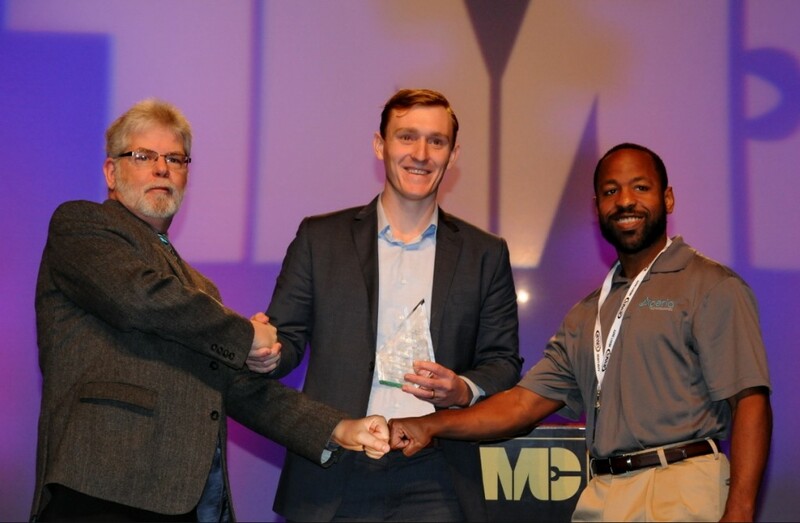 The award was presented during the Technology & Maintenance Council’s (TMC) Annual Meeting & Transportation Technology Exhibition in Nashville. Halo bolts onto an axle hub and uses the wheel’s rotational motion to drive an internal pump that maintains air pressure in a tire. It operates on a similar principle to a self-winding watch, Aperia executives said when they unveiled it last year. Halo can be used on drive and trailer axles, and a version is in the works for steer axles. The award was accepted by Aperia CEO, Josh Carter and chief technology officer Brandon Richardson. Both are co-founders of the Burlingame, Calif.-based company. Aperia’s Halo was picked from five finalists through an elimination process that started with more than a dozen products. The four other finalists were Dana’s Spicer AdvanTEK 40 tandem drive axles, Fontaine Fifth Wheel’s dual camera system, Peterson’s LumenX Series 7 LED and Webb Wheel’s Vortex Unlimited vented brake drum. The award finalists were chosen by the association’s Technical Achievement Award committee, including Paul Abelson of Road King and Land Line magazines, John Baxter of Baxter TechWrite and technical director of Advance Diesel Concepts, Tom Berg of Heavy Duty Trucking and Construction Equipment magazines, Peter Carter of Today’s Trucking, David Kolman of Fleet Maintenance Magazine and Road King, James Menzies of Truck News and Truck West, and Jim Park of Heavy Duty Trucking (chair). To give you a update I have been working with the guys at Aperia that have installed (4) Aperia Halo Tire Inflator system on (4) New (3) Axles Paller trailers for Linde Canada Limited in 2014,(2) working from the Linde plant in Montreal,Quebec (1) at the Linde plant in Brampton,Ontario and (1) at the Linde plant in Langley,BC.